Memory strengthens, this time of year. The present holiday lies over many past years of lighted candles in Menorahs, or snow falling, or a record of Handel’s Messiah playing as generations of family ornaments come out of boxes to decorate the tree. At the Bennington museum, memory has taken tangible forms. For the 20th anniversary of its holiday festival, the museum in Bennington, Vt., has re-imagined the annual show. This year they have asked artists to respond to one of the museum’s new acquisitions — the Memory Ware Tower. 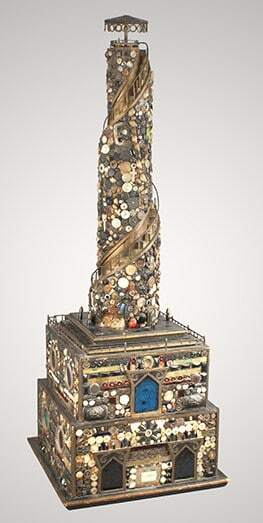 Stephen Warren’s “Memory Ware Tower” has inspired this year’s “Festival Re-imagined” at the Bennington Museum. Image courtesy of the Bennington Museum. The festival committee wanted to reach out to the community and local artists, said museum curator Jamie Franklin, and to incubate new work: as the museum’s Executive Director, Robert Wolterstorff, likes to say, the root word in museum is Muse. The Memory Ware Tower is a 4-foot-tall spire with a spiral stair made by Stephen C. Warren in West Hartford, Vt., in 1894. Franklin recently acquired it for the museum’s permanent collection. He has concentrated in the last few years on building the museum’s collection of grassroots art — Brût, folk, visionary work by self-taught artists outside the mainstream — and he highlighted grassroots artwork work in a wide-ranging exhibit last summer, including the memory tower. “It’s a spectacular object,” he said. Memory ware was a popular pass-time in the 19th and early 20th centuries, he explained. People attached trinkets, buttons and shells to bottles, boxes, Mason jars. But this one is unique in its size and shape. He thinks of it as an observation tower. Beyond the maker’s name and date, he has found few records of Warren’s life, he added, except that he is listed as a “Jack-of-all-trades” in his Civil War enlistment papers. He married, raised children, worked as a laborer and mechanic, and when he was 70 years old he made this mosaic. The tower reflects the idea of memory and the ways an object can have stories embedded in it, Franklin said. And the artists’ responses have varied widely. Four members of the local arts community juried the show: Anthony Cafritz, artist and founder of Salem Art Works arts center and sculpture park in Salem, N.Y.; Joyce Hall at Bennington Pottery; Stella Ehrich, an artist in North Bennington; and Gregory De Luca, proprietor of Three Pairs Gallery in Dorset, Vt. They looked for artists whose work resonated with the tower, Franklin said. Some of these artists have shown work at the museum over the years, but this is the museum’s most concerted effort, in the more than 10 years he has been here, to highlight contemporary art, and his first chance to curate a large-scale show from jewelry to sculpture, paintings and photographs. Others explore the idea of memory. In “Memory Moth,” Marcy Hermansader collages old postcards of waterfalls — moving, flowing, hard to hold. Emily Gold, a book artist, has created an accordion book with free associations, thoughts on memory, and prints made with natural vegetable dyes. Artists are often asked to donate work, Franklin added. The museum has assembled these works in an ongoing auction, and for any work that sells they will split the revenue with the artist. Sometimes the connections to the tower are clear to see, he said, and sometimes they take some thought. The show includes the artists’ thoughts about the work, and at times he has made connections the artists themselves have not made. Leslie Parke, a painter in Cambridge, N.Y., has always taken photographs as sources for her paintings, Franklin said, and recently she has begun printing the photographs themselves, large, bright and abstract. In the show she has offered a recent image of a palette wrapped in plastic behind a hardware store, and the camera looks through the plastic and condensed water drops. Looking at it, Franklin thought of reflection — past events clouded by time and experience — the idea of something not quite clear to see or grasp. Parke enjoyed his response. She told him she had been thinking back to her college days, before she became a realist painter. In those days she studied abstract art and immersed herself in bright color. At the top: Leslie Parke’s “Rumi’s Ruby” appears in the Festival Reimagined at the Bennington Museum. Photo courtesy of the Bennington Museum.